Adaptive reuse is the process of repurposing buildings for viable new uses and modern functions, other than those originally intended to address present-day needs. Reuse allows for a building's continued use and helps it remain a viable community asset. Buildings have been reused for hundreds of years, especially in the 17 and 18th Centuries when scarce building materials and limited transportation made it difficult and expensive to construct new buildings; it was frequently easier and less expensive to convert existing structures to other uses. But as the country became industrialized and a national transportation network was developed, access to low-priced materials that could be delivered on an extensive roadway system and available labor made building reuse less desirable. These economics made it easier to demolish older buildings and replace them with new structures. This situation has changed. Materials and labor have become more expensive and the disposal of demolition debris in landfills is less convenient. The character and unique qualities of older buildings are recognized, and their contribution to their neighborhood character is valued. While adaptive reuse is most often associated with the preservation of historically or architecturally significant buildings in a community, it also can provide renewed vitality to any buildings that may be underused, abandoned, vacant, dilapidated, or functionally obsolete. Reuse brings both older and newer underused structures such as empty warehouses, vacated former schools, abandoned department stores, large historic homes, dilapidated strip malls back to life. These structures have become senior housing, apartments, banks, municipal buildings, restaurants, and have been converted to many other uses. Their original use no longer exists, such as a telegraph office or phonograph manufacturer. One of the most familiar types of reuse is the residential conversion from a single-family detached dwelling into two or more dwelling units, and many municipal zoning ordinances permit these conversions. Often projects that are thought of as "rehabilitations" also entail changing use or function, and thus also involve some level of adaptive reuse. Energy Conservation: Energy is conserved by reclaiming and repurposing existing structures and their materials and their embodied energy, as well as making use of existing available infrastructure such as access to transportation and utilities. Contributes to Sustainability: Existing structures are often located in established growth areas with a significant population density and in developed areas, reusing these structures will help support the neighborhood. Enhances Community Character: Ruse retains historic resources and community character by providing renewed life to historic structures in an economically viable manner. Building reuse can provide a link between the community's history and its present and future while accommodating up-to-date needs, and is often more harmonious with community character than new construction. Encourages Investment: Reuse can encourage more investment, development, and revitalization in areas and in other structures that might otherwise remain vacant or underused, yielding potential tax generation and employment opportunities. Cost Savings: Rather than demolishing existing structures that have outlived their originally intended use, reuse saves on demolition costs, champions recycling, and creates unique design opportunities. Potential Tax Advantages: Owners may be eligible for federal tax credits for rehabilitation investments in older or historic buildings and other incentives. Increases Market Value: Values can be increased by preserving aesthetically-appealing building features and architectural elements that are often characteristic of older buildings. Materials and quality of construction of the past is often not economically possible to reproduce today. Saves Time: Provides potential time savings can result through building reuse because the building and infrastructure is in place, and municipal approval and permitting can occur more quickly and less expensively than comparable new construction. Environmental Benefits: Reuse can provide environmental and public-health benefits through the remediation of contaminants associated with some older building materials as well as former industrial or commercial sites. Physical Limitations: Structural constraints involved with retaining aesthetically appealing, architectural or historic features may make fitting a new use into an existing building challenging, and may require added creativity and flexibility. Regulatory Constraints: Existing structures may pre-date zoning, building permit, and other local development regulations and thus their rehabilitation to meet modern requirements can be challenging. For example, zoning may limit uses and restrict possible reuse opportunities, or require variances. Off-street parking may be difficult for an existing older building to meet. However, the statewide building code has built-in reliefs to help address this matter. Potential Environmental Hazards: Environmental contaminants such as asbestos and lead can be present in many older buildings, requiring costly mitigation. Each reuse project is physically unique but many share common elements. A successful reuse project first requires cooperative planning between municipalities and developers. From a development perspective, preliminary steps for possible reuse should identify potential risk factors and assess existing conditions, regulations, market and economic conditions, neighboring land uses and lot sizes, location, access, site, structural, architectural and historical considerations, and building reuse potential. Next, conceptual plans and cost estimates are prepared. Then, suitable reuse alternatives are identified and a work program and a financial analysis are then completed. Thorough early planning can help save cost and time and help avoid problems during the physical rehabilitation stage. Unlike new construction, the building, location, and market are already established in reuse development projects, and successful reuses are responsive to local market demands. Reuses should be sensitive to the building's character-defining features, which can improve the project's uniqueness as well as its success and marketability. Other important factors include finding a market niche, providing a mix of uses, maximizing usable building space, and taking a collaborative approach. Revisions to codes and ordinances may be necessary to permit building reuse, and a municipality should consider the types of requirements that would be most appropriate. For example, urban areas generally permit a greater mix of uses per district which can help encourage reuse, while suburban areas may inadvertently discourage reuse due to the predominance of single-use zoning. Also, a community with many vacant or obsolete industrial structures could consider reuse as an option to help eliminate blight, stimulate economic development, and preserve older and historic structures, and allow a wider variety of uses in these buildings. Zoning districts can specifically permit adaptive reuse or conversions of residential and nonresidential buildings, as well as permit additional uses as catalysts for adaptive reuses. Zoning provisions that contribute to the economic feasibility of reusing a building for housing can permit higher densities, maximize use of floor space, permit home offices in multi-family dwellings, and allow flexibility in parking requirements. Meeting parking requirements is often a key concern on older established sites, which may not contain enough lot area to meet modern parking demand, and finding creative solutions to fulfill parking needs may be necessary to help in the reuse of existing buildings (such as off-lot and shared parking facilities). When located in historic areas, historic resources regulations or exterior building design guidelines as well as consultation with the municipal historic commission should be considered. Municipal reuse incentives can involve providing staff support, supplying information and data, serving as a liaison with community groups, providing property tax abatements or other regulatory incentives, such as density bonuses. Additional municipal incentives can involve assisting with obtaining grant funding, infrastructure upgrades, and environmental mitigation. The municipality should cultivate a development climate that openly promotes adaptive reuse and a high level of municipal interest and support. West Whiteland Township has an effective set of historic resource protection standards and enforcement provisions. 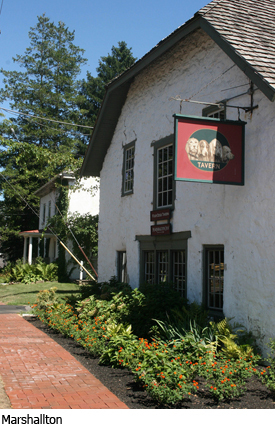 The Township Historical Commission is charged with maintaining a survey and inventory of historic resources including the Township Historic Resources Map, reviewing applications for rehabilitation, enlargement, or alteration of historic resources for compliance with the Secretary of the Interior's "Standards for Rehabilitation and Guidelines for Rehabilitating Historic Buildings"; providing advice to the Township on historic resources matters, among related activities. The Township also has "Additional Use Opportunities" that are permitted in the Township's historic resources, in addition to the land uses normally permitted. 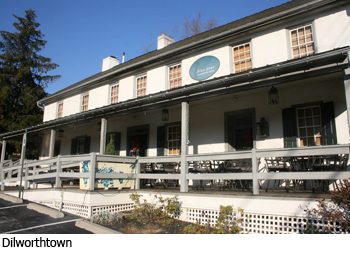 These Township historic preservation standards are found in the Zoning Ordinance. Community Development Block Grants from Chester County's Department of Community Development have provided financing for many adaptive reuse projects throughout the County, e.g. Parkesburg School in Parkesburg Borough, Oxford Hotel in Oxford Borough, Jefferson Place in Phoenixville Borough, North Second Avenue in Coatesville, and Liberty House in Schuylkill Township. Liberty House is a 50-unit affordable rental housing facility is an example of a reuse in a suburban landscape. Washington Square Professional Offices and Apartments in West Chester Borough is an example of a successful adaptive re-use of a former school building into a mixed use building in an urban landscape. 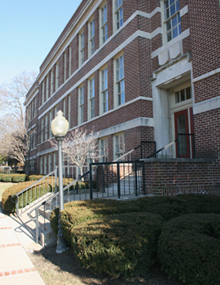 The Pierce Elementary School, built in 1917, was closed in 1976. The reuse project was initiated by a private entity interested in preservation of older buildings. Market studies suggested the need for apartment and office uses within walking distance to the town center, and provision of adequate parking was considered a key factor for project development. Zoning was in place which allowed the school building to be reused. A development plan was put together and the project was determined to be economically feasible. The school building was purchased directly from the school district, and the project was undertaken in the 1980s using a combination of private funds (owner and investor monies and bank loans) and public (federal) rehabilitation tax credits. The building is a contributing structure within the West Chester National Register Historic District. Building code standards for rehabilitations were employed for meeting safety standards. Due to thorough planning, factors which otherwise might be considered a reuse risk, e.g. asbestos removal, were known in advance and no surprises were encountered during rehabilitation. The design for the new use incorporated defining historic and architectural building features and retained as much of the school's interior floor plan as possible to facilitate reuse. In October 2008, Pocopson Township took possession of 68 acres at the northwest corner of the intersection of Lenape-Unionville and South Wawaset Roads. This land was transferred from Chester County to Pocopson at no cost to the Township. 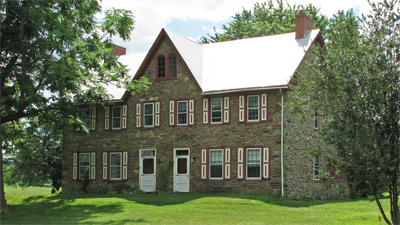 The transaction included the Eusebius Barnard House, an early 1800s stone house and a stop on the Underground Railroad located opposite the Pocopson Home. This historic stone house will eventually be renovated and repurposed to house the Township's administrative offices and public meeting space and as a home for the Kennett Underground Railroad Museum. A top priority is to utilize green and resource renewal technologies to make the renovated building a showcase project for carbon footprint reduction. Retrofitting the existing wood windows is important to maintaining the historic appearance of the structure while reducing energy usage. Water reuse and energy saving electric lighting are also part of the plan. Adaptive Reuse and Feasibility Studies from the Heritage Conservancy. Adaptive Reuse Makes Buildings Better With Age (Oct 2012, Sustainable City Network). Help the Aged: innovative adaptive reuse in architecture, from Architonic.